Things like that always made me feel lonely when I was alive. By the start of the story, Kazu has already passed away, and in a ghost story of sorts, he drifts through the place that was his final home, watching life go on in the big city without him. Ghosts often have a reason for haunting a place, and as Kazu’s appears to be a need to take stock of his life, the park is a good place to do so. As he looks back, remembering his youth in the far north and his itinerant lifestyle in search of work, a slightly unusual connection becomes apparent. The park he eventually finds himself in is actually called Ueno Imperial Gift Park, a ‘present’ from the Emperor to the nation. As it turns out, this is just one of the many links Kazu has to the Japanese royal family, even if his life has turned out very differently to theirs. Yū’s only previous work in English, Gold Rush, was an excellent psychological novel looking at damaged youth and a violent society, but Tokyo Ueno Station is a rather different affair. Far shorter, and simpler in many ways, it focuses on a man looking back at his life from beyond the grave and wondering where it all went wrong. Kazu’s life acts as a reflection of the history of his country, with his life covering a turbulent period for Japan. Born in 1933, he recalls the hardship caused by the war, his work on construction for the 1964 Olympics and the bursting of the bubble economy. With the tale taking us to Fukushima and beyond, Kazu seems to have been there and done it all. This is exactly what has happened to Kazu, and the country is to blame. He realises that while he’s been assisting in Japan’s economic rise, he’s missed out on his own family’s ‘history’. However, he’s far from the only one, and the choice of Ueno Park as the setting is apt. Quite apart from showing us the symbolic statues scattered throughout its grounds (enemies and allies of the Emperor alike end up there immortalised in stone), Yū examines the open secret of the masses of homeless people in the heart of the capital. We are shown how the authorities treat them, ostensibly tolerating these long-term residents while drawing up a host of rules to keep them in line, forcing them to shift themselves and their tent kingdoms from one site to another on a whim. There are also the many temporary evictions that occur when the royal family decide to visit the park’s galleries and museums – we can’t have the Emperor seeing the less fortunate among us. 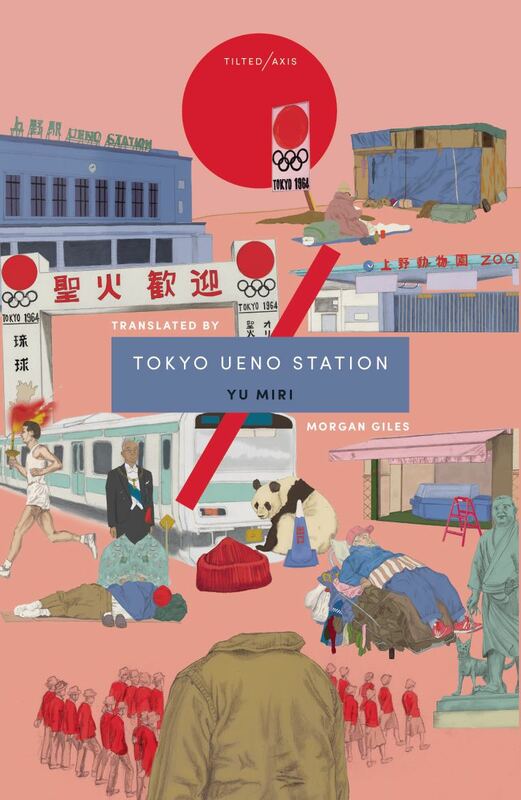 Tokyo Ueno Station is a beautiful short novel, and what could have been angry is instead calm and understated, and perhaps all the more effective as a result. Morgan Giles has done a wonderful job in her first full-length translation, catching the restrained tone of the main story along with some of the more light-hearted elements, such as the casual chats of the people in the background, the dog walkers or the middle-class women passing though the park on their way to a lunch that costs more than Kazu sees in a month. These happy faces serve as a reminder that there’s more than one side to the story. Yū contrasts these content passers-by with the people they’ve left behind. However, it’s also a reminder that under the glossy surface of every successful nation, there is an army of exploited workers dragging their aching bodies from construction sites to tarpaulin huts. Japan may well be an advanced country, but not everyone enjoys their fair share of the wealth. If there’s one part of Tokyo Mr Gums and I know well, it’s Ueno Station and Ueno Park as it is in this vicinity we usually stay on our way into and out of Japan. I think I must read this. But MUST and WILL can be far apart in my corner of the world. I like that this sounds understated – that sort of style and tone appeals to me.